The Big Island's favorite family adventure! Float downstream on an inflatable kayak on the famous Kohala Ditch. Cross 7 flume structures, paddle through 10 tunnels, and float through beautiful Hawaiian rainforest. This family-friendly adventure is VERY popular and reservations should be made well in advance of your vacation dates to ensure your space on this unique tour! For an all-around Hawaiian adventure, join Hawaii Forest and Trail into the heart of the Kohala countryside. North Kohala is a land of old sugar plantations, Hawaiian legends and untouched natural beauty. The excursion begins with a scenic drive through the Kohala countryside. Upon arrival in Hawi town you will ride a 6-wheel drive Pinzgauer offroad to the trailhead. Walking along the 1.5 mile loop trail, you’ll pass two streams with seven waterfalls and three bridges, exploring ancient Hawaiian terraces and the flumes along the famous Kohala Ditch. With easy walking, countryside views, and a chance to cool off swimming in a mountain stream with cascading waterfalls, this is an ideal family adventure! Lunch is served during the tour, and on the way back a brief stop is made in Hawi town for you to check out the art galleries and quaint shops. Mystical Waipio Valley- the "Valley of the Kings"
Waipio on Horseback offers special guided excursions in beautiful and secluded Waipio Valley, also known as Hawaii’s “Valley of the Kings.” Your adventure begins at mile marker 7.5 on the road from Honokaa to the Waipio Valley overlook where you will check in for your ride and meet your guide. You’ll begin your tour with a memorable and hair-raising 4-wheel drive van ride to the bottom of the valley floor. The road is the steepest in North America with a vertical drop of 900 feet in less than a mile. The road is so steep that In places the grade hits 45 degrees! Don’t even think about taking your rental car down here. Getting into (and out of) the valley is half the fun of this tour. 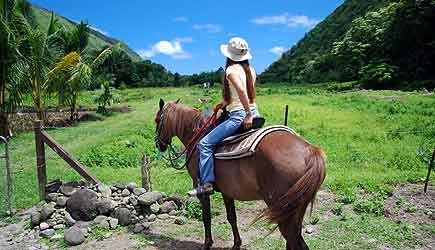 Marvel in the spectacular scenery as you ride on top of 200-foot sea cliffs along the magnificent Kohala coast. Follow in the footsteps of King Kamehameha as you travel this ancient pathway. Enjoy local snacks at a secluded pebbled bay with a birdseye view of Keawaeli Bay – favored by the King for the warmest winter surf …with waves of 20 to 30 feet! Halemaumau Crater - a new vent opened here in 2008 and it is still active! The summit rim is lined with steam vents - feel the heat! Witness lava entering the ocean - forming new land before your eyes! 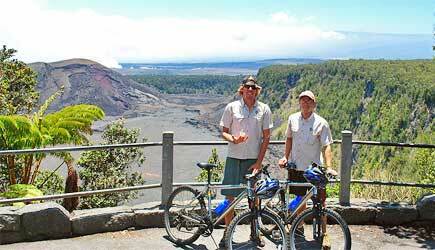 Guided bike tours around the Big Island’s active volcanic region. 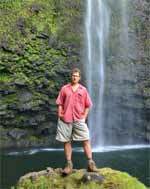 The Kilauea tour covers the summit craters and lava flows leading down toward the ocean. The Bike to Pele tour take you the East Rift Zone with its stark contrast between the jungles and rural living of “Old Hawaii” and the new reality of lands that have been overrun with lava (and homes destroyed and new black sand beaches formed) in the last 60 years. Explore the beautiful scenery and natural beauty of Hawaii while you swim, float, rappel and hike through the valley. Enjoy the unique features of the Umauma River. After you rappel into the river, relax as you you float down to a 100 year old flume dam, which was made in 1910 and is still perfectly in-tact today. On this tour, you will also rappel down two waterfalls. The only activity available for cruise ship passengers is Bike to Pele Tour on the day you are in Hilo port. The transportation is available at Hilo Harbor.